I recently read a handout from Alley Cat Allies that recommended a pre-exposure rabies vaccination to anyone who handles wild animals (i.e., feral cats). With a mind geared towards minimizing high-consequence risk, I called around to find out more. The first thing I learned is that there is a distribution problem with rabies vaccine this year and King County Health reports that they “do not have vaccine available for pre-exposure rabies vaccination”. This is to ensure there is enough vaccine available for post-exposure vaccinations. I turned to my Group Health primary care provider, and she passed on my inquiry to their infectious disease department who provided detailed information about rabies and vaccinations. I gathered more information from the Center for Disease Control website. The pre-rabies vaccinations consist of a series of three shots taken on day 1, day 8, and day 22 or 29. This series does not eliminate the need for care should you be bitten by a rabid animal, but it does reduce it. I was quoted a cost of $243 per shot, making this ounce of prevention equal to about $729 at Group Health. Post-exposure rabies treatment with no pre-exposure vaccination includes one dose of immune globulin and four doses of rabies vaccine over a 14-day period (at an estimated total cost of $2,000). Contrary to popular belief, the shots are not given to the stomach, unless that is where you were bitten. Either way, that’s a lot of money. The other bad news is that untreated rabies will kill you, but the really good news is that it is 100% preventable if treated in time (once you start to show symptoms survival is rare). The rabies virus is transmitted via saliva which means bites are the most likely way to get it, although you might also get it if the cat licked its paw/claws just before scratching you. So, what do you do if you’ve been deeply scratched or bitten by a cat that has not been vaccinated for rabies? First, consider the situation urgent. Wash the wound thoroughly with soap and water. Do this as soon as possible, and, if at all possible, capture the cat so it can be tested and observed for any signs of illness. Also, contact your doctor to make the determination on whether and when to start rabies treatment. For the time being, I think I’ll pass on the pre-exposure rabies vaccination. It just feels like too much money. We already have solid procedures in place for moving and feeding the ferals as we prepare them for spay/neuter and vaccination (cats are generally not vaccinated for rabies until they reach four pounds). Instead of the vaccine, I’ll focus my next bit of research on tracking down a pair of elbow-length scratch proof and bite proof gloves and let you know what I find. So, we renamed Bob to Button. I liked the nicknames that came from Bob such as “Bobster” and “Boblet” but he was not a straight Bob. I think he’ll also grow out of being a “Button” but the lucky people who adopt this guy can find a name he will grow into. Our last post about Button ended with him and Ginger starting to play together. By the evening of their 3rd day they were good buddies. I put one of our cat beds on my desk. It just fits one of our adult cats but will hold two kittens. On the third day, when they were well on their way to being friends, after a round of play, Ginger was laying in the bed. Button approached the bed and sat down. I could see that he dearly wanted to get in bed with her but did not know if she would accept him. I have my self and seen other people have the exact same hesitation: should I approach them or not? Well, little Button tested the waters with a paw, sat back as if nothing was going on, then climbed into bed with Ginger. I would like to say she was completely accepting, but Ginger is a little feisty. She gave a few play swats but they did settle down together. Since then we frequently see them snuggling together. I think Button has been having the time of his life. The first time I heard Button purr was when Nelson came into the room He got all excited, jumped down on the floor, and started purring. The little guy really likes cats. He’s approached all our residents in the same way. Unfortunately, they are adults with adult worries and not enough social graces to be gentle with a young one. After Button was rebuffed by Nelson I picked Button up and told him it was Nelson, not him and that he is perfectly lovable as he is. And this was the first time he purred when I was holding him. Marie and I have both been picking him up more. Now he is comfortably enough with touch that he will generally let us pet him, will usually start purring, and often remains relaxed. He is more relaxed when we pick him up, more so with Marie. The first couple days we had him we never heard him purr. 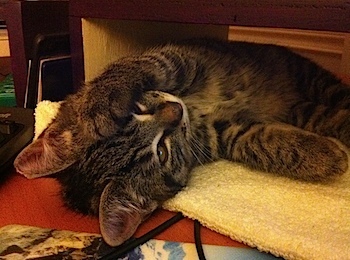 On Saturday evening Deborah brought us a little feral grey tabby in need of more socialization. He was always the timid one of the litter. His siblings were handsome, interested kittens but Button held back. While his littermates were adopted, Button was clinging to his mother and would not open up to human interaction, which would make it difficult for him to be adopted. The difficult decision was made to separate him from his mother and bring him here to socialize with us. This arrangement was not only better for Button, but also for Ginger, the female orange tabby who is still waiting for a home, and who seemed lonely after we adopted out her brother. Button arrived scared and immediately crawled into the cubby hole. Ginger went in to find out what it was about and snuggled with him. A good start. However, once Button started to explore the room Ginger started to hiss at him. Button would let us pick him up but he really didn’t respond to human touch. Biscuit and Ginger started shy, but as soon as we touched them they wold purr and melt. They were easy to socialize. Two weeks later Ginger was affectionate and reasonably confident. Button, on the other hand is not affectionate and just scared. Button crawled onto Marie’s lap. Well, really into a safe hole under her legs but close enough. He mostly hid and we let him do this. Ginger came out and demonstrated how receiving pets from a human was fun. Button got interested in Ginger’s purring and came to investigate but when the two got close Button flinched and they both jumped back and hissed. I introduced Button to the under-monitor cubby, which Ginger had abandoned. He seemed to like being near me. At the end of the day he appeared very relaxed. Marie decided to sleep in the kitten room to give Button more time around people and to make sure the play between Button and Ginger never got too rough. The sleep cycle of kittens and people is somewhat different. 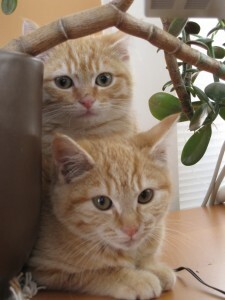 Kittens tend to go through several sleep, eat, play cycles during the night while most people just want to sleep. But this night, there wasn’t much sleep to be had. Between trying to comfort one crying kitten, cleaning up the vomit of the other, and enduring the random play and missteps of both throughout the night, she couldn’t have had more than 4 hours of actual shut eye. Poor Button spent much of the night pacing and crying – we think calling for his mother. While not affectionate, Button wanted to be closer to both of us. Mainly, he missed his mom and kept calling for her with loud peeps. Our girl Luna sometimes walks around the house carrying a stuffed toy yowling in a plaintiff way. We always thought she may be looking for her lost kittens. As soon as Button heard Luna he was at the door peeping as loud as he could. Eventually I let him out. In contrast to his shy behavior he strode boldly into our bedroom, ears forward, tail held erect. He wanted to be friends with Luna but she was decidedly luke warm. Eventually he settled under our bed. After he had some rest there I brought him back into my office. There he found a mouse and started playing with it. Through the afternoon I would bring out the mouse toy and play with both of them. When focused on play they were willing to get much closer to each other without hissing. By evening, when I left off playing with them Button would continue and Ginger then join in. They still have moments of surprise and hissing. Ginger appears to be much more wary of Button than Button is of her. Mainly, Button is having fun and relaxing. Next is to get him to really enjoy being held and petted. 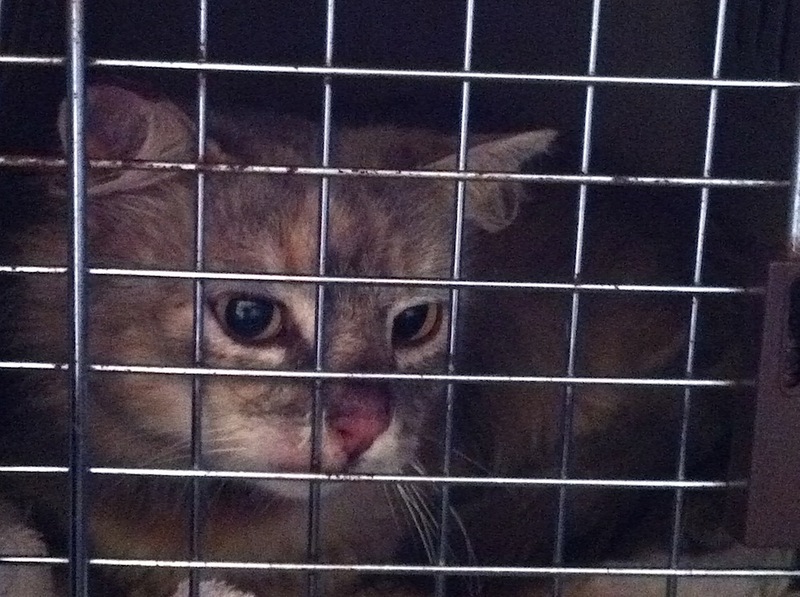 Last week a family of feral cats was trapped, spayed/neutered, and vaccinated. Mom was returned to the wild while the kits undergo socialization to prepare them for adoption. After a certain time in the wild, cats will never be suitable pets. Socialized young enough and they can make wonderful companions. Biscuit (boy) and Ginger (girl), both around 8-10 weeks old, having been living in Tom’s office this week while he’s out of town. They are adorable and still pretty shy but already less skittish and hissy. A big part of socializing them is just letting them get used to you. They already have learned to love “da bird” toy, and allow me to hold them every once in a while. I love this job. We are working with the Ally Cat Project – a small cat rescue in Seattle which works primarly to place feral cats in barn homes and shy but socializable kittens as companions. 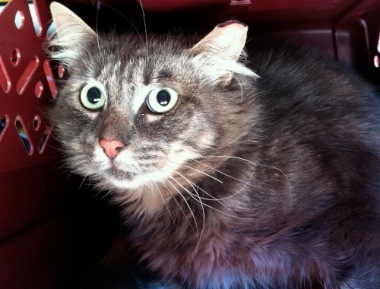 You can read more about Alley Cat on their Petfinder Page. 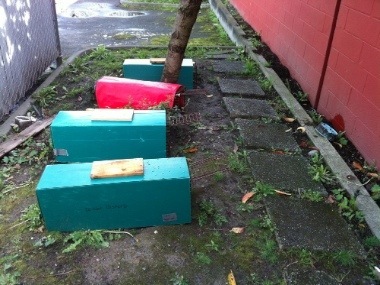 We armed the traps on Saturday, 9/25, to capture cats for clinic on Monday 9/27. 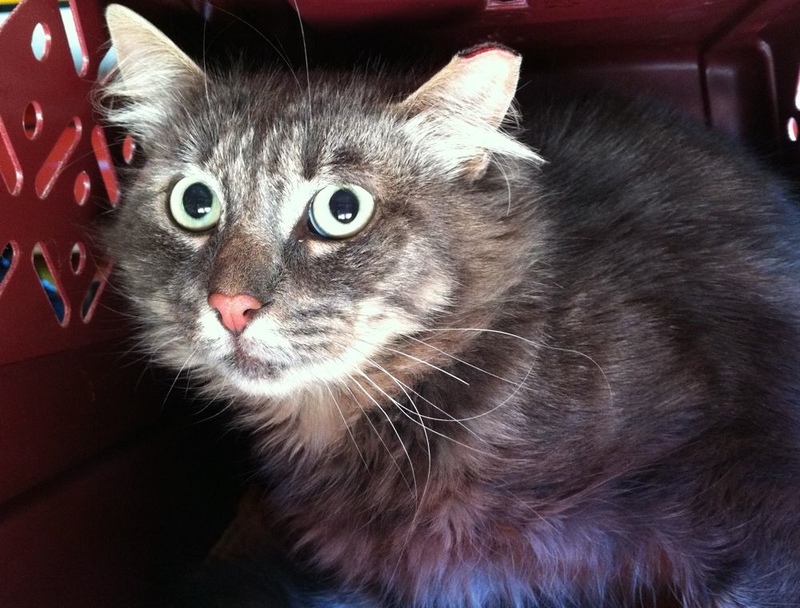 A medium hair grey tabby, related to Fluff E and Little T but much bigger. He has large paws and a large head like our resident Jojo. When threatened he growls, like Jojo. I transfer him to a medium carrier, taking care to not present any possible exits. I put the carrier in a cage and open the door. When I check back later he is out of the carrier, in the rear of the cage and looks miserable. Late on Sunday we catch a light grey female. She too is very unhappy to be in the cage. Again, Marilyn of Forgotten Felines is there before me with six kittens for the clinic. They are less busy today. When Marie picks up the cats they tell us that Big T is 12 lbs and looks healthy and well fed and that he has an intimidating growl. We’ll release him on Tuesday but hold Lucy for several more days to ensure she is well. Tuesday we decide to release BigT because he’s spent the last 12 hours laying in his carrier. He is either depressed or not recovering – we can’t tell. Since the clinic said he was generally robust we decide it is probably depression and decide to release him that evening. At Mud Bay we open his carrier door. He takes several seconds, pokes his head out to look back at us, and then takes off. Trapping planned for next Monday’s clinic. Because we buy a lot of food at Mud Bay we have gotten to know one of the clerks, Jon. He asked if we knew anything about trapping feral cats as there is a colony behind Mud Bay. There are an incredible number of people working to help feral cats in this city. This is good because there are an incredible number of feral cats. I always knew there were some, but did not appreciate how many until I started to work with feral cats. I knew that Deb, our Seattle Animal Shelter foster case manager, worked with ferals so I ask her. The problem with feral cats is that their life is difficult and they breed more feral cats. The consensus solution is to trap, neuter, and release (TNR). Most of these cats will not be happy living indoors or with people. Since there are already many healthy, friendly cats who do need a home it is not worth putting the effort into cats who don’t want to be a companion. Releasing them back allows them to live out their life in the environment they are familiar with. Neutering them prevents them from brining more cats into that life. Jon described about 5 cats that lived behind Mud Bay. A mostly tame pregnant female he was able find a home for. We decided to trap, neuter, and release the remaining cats. We gathered supplies, many lent to us by Deb, set a clinic date and placed several unarmed traps with food to encourage the ferals to go inside the traps to eat. The Sunday before we were to take them to the clinic, we armed the traps. Early afternoon Jon calls – we have a cat. It’s the friendly little grey cat, a medium hair tabby. He’s not tame but will approach closer than any of the other cats. Jon names him Fluff E Face. 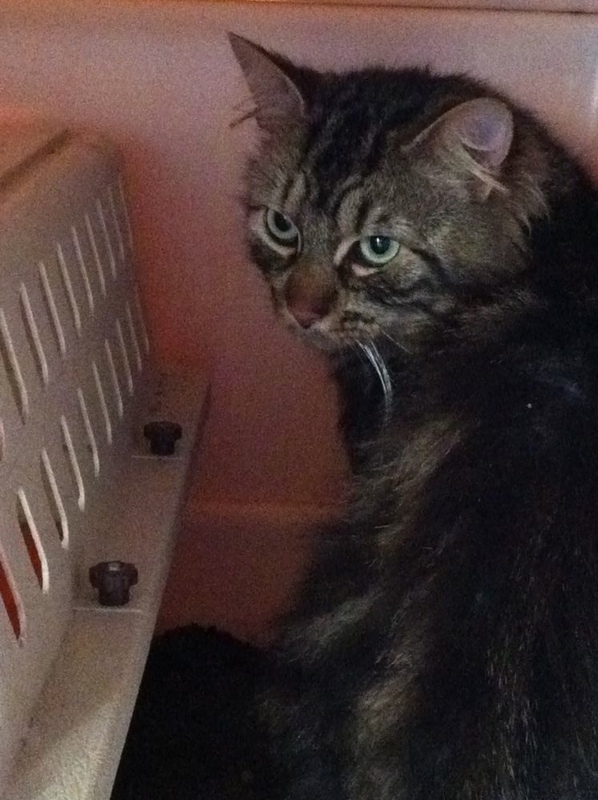 We take the trap back to our garage and successfully transfer him into a carrier. A couple hours later we get another cat, twin to Fluff E, who we name “Little T”. 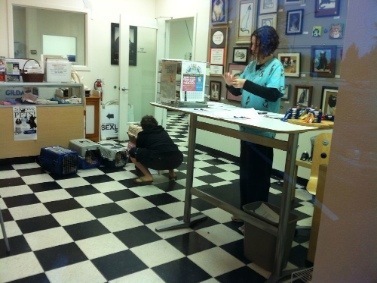 The Puget Sound area is served by the Feral Cat Spay and Neuter Clinic in Lynwood. They run free clinics, 3 to 4 times a week, with up to 50 cats per clinic. Because they are such high volume and low cost there are specific procedures we must follow, such as bringing a clean towel for each cat. The clinic takes some reservations which fill up one to two weeks in advance. They also allow up to 10 drop in cats. Most trappers I’ve talked to use the drop in and just show up early. The clinic opens promptly at 7 am and we are there at 6:30 am to make sure we get a spot. 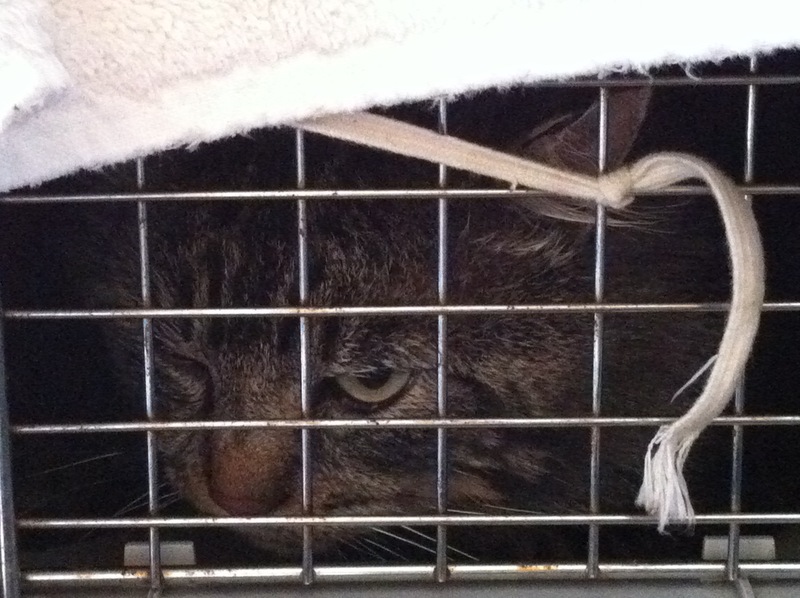 Little T is clearly not happy being in the cage so we release him one day after surgery. He shoots out of the cage, under a fence, and is gone. Fluff E’s status is less clear. We end up holding him for a week to evaluate his socialization potential but in the end can find no one with the dedicated space and time to take on this task and back to the briar patch he goes. We have seen him several times since then, hanging around the traps. Unfortunately, he seems to be a likely candidate for re-trapping. I am used to seeing cats as companion animals, not as wild animals. But that is what these feral cats are: wild animals. They are dirty, scared, and agressive.